This week’s passage starts a new Seeds Family Worship album: Seeds of Praise. It’s hard for me to believe, but this album is going to finish out my year of weekly verses! Because of Christmas I might mess with the track order a little, but we’ll see. Pretty much any verse can connect with Christmas if you try hard enough, right? As always, I could say a lot about these verses. There is a lot to them. This is a psalm of David, written when he was in the wilderness and in need of protection. The life of David is full of rich lessons– both in what to do and what not to do– and the words of praise he wrote to the Lord are truly a gift to God’s people. I am praising God for preserving these words throughout history so that I can benefit from them today. What if I don’t feel like my soul and body long for God? Like, what if I don’t recognize that on a regular basis? And what if I don’t regularly feel that God’s love is better than life? The thing is, it is still the truth. Even if I don’t acknowledge my need of God, or the supremacy of his love, it is still there. Would David have written these same words from the comfort of his palace and in the company of others, or is there something about being in the wilderness: alone, aware of mortal dangers, in urgent need of help, away from the distractions of the world? I can testify from my own experience that I am more apt to acknowledge these truths when times are hard and my own strength is depleted. What I’m taking from this passage today is that, yes, I am always in need of God whether I recognize it or not. This world is a dry and weary land without water. The things of this world and the inventions of my sinful mind and heart will not satisfy me or bring me life. Whether I acknowledge it or not, God is what I need. I can see it better when I’m in the wilderness- when I’m desperate and searching, or when distractions have been removed– but it is always true. Whether we’re in the wilderness or not, the lessons learned there can remain in our hearts. Today I’m praying that God will teach me to remember my need for him, to remember that his love is better than life. Those words truly say so much, because there is much about this life that is good! But just because this life is what’s in front of my eyes does not mean that it’s all there is. I pray that the Spirit will call me back to the eternity written upon my heart by my creator, reminding me that the love of God is better than anything my eyes have seen. I’m struggling to sum this up and end this post without saying so much more than I have time to write! I’m going to have to end even though I don’t feel ready, and I don’t feel like I’ve said what I wanted to. Hmm, maybe this is how it feels when my soul and body (right now specifically my mind) are thirsty and in need of God! It’s a frustrating feeling, but it reminds me of my position before God and the beauty and power of Scripture. The Spirit is in these words, making them living and active– this is a gift from God to those who seek him. It’s my prayer right now that God would bless my heart and bring more understanding to my mind as I think about these verses, and that God would bless anyone who reads this, providing his gracious wisdom to us all as we seek to know his love. May we recognize our need of him, see that his love is better than life, and give him praise. With that, I’m done. Please enjoy this beautiful illustration of Psalm 63:3 by Jenny of French Press Mornings. She makes some of the loveliest Scripture prints I’ve ever seen! She has an etsy shop, too. I thought it was important to include verse 5b here. It makes sense to me that Seeds did not include that part in their song, as their audience is primarily children. It’s a tricky topic and I wish I had the time and energy to get into it. I learned a little bit about the idea of God’s punishing sin in future generations last year during Bible Study Fellowship’s Moses study. I don’t believe God does this now under the new covenant, but rather each individual is responsible for her/his own sins and likewise is offered an individual chance to accept salvation in Christ. But the natural consequences of sin do affect subsequent generations. We see this now in cycles of abuse, addiction, poverty, etc. that are essentially “passed down” from generation to generation. And the opposite is certainly true; loving relationships, healthy or wise living, and faith can all be passed down from generation to generation. Exodus 20:3-5 shows us some rules that a loving God set forth for his people so they would be a people who followed him for generations to come. I can’t say that God’s jealousy is a characteristic I truly understand. I think sometimes I view God as being indifferent to my foolish, selfish, or otherwise sinful choices, but he is not. And I can’t blame him- he knows the best way for me to live and has laid it out clearly for me in his Word, so when I choose the other way it is only natural that he would be hurt or upset. Not that he is any less complete without my measly offering of obedience, worship, or dedication, but these verses (and others throughout Scripture) tell me that he must miss it. He knows he is the holy, just, everlasting Creator and is complete and perfect as Father/Son/Spirit, but he wants me to be connected to him. Contemplating this verse has caused me to view God’s jealousy in a little more relatable light, something that is only natural because of God’s love, light, holiness, and wisdom. Well, I am off to take some more meds and drag myself back out into the world of the living. Have a great week and please share your thoughts on this verse if you have something to say! First of all I want to point out that Psalm 90 is attributed to Moses. Just if you wanted to know. 🙂 After thoroughly studying the story of Moses and the Exodus last year in Bible Study Fellowship it is helpful context for me to have as I read these words. Last year I learned a lot of things about Moses I hadn’t considered before. Most notable to me is the humility God displayed in his life. It was great timing for me to study Moses while realizing I was in need of humility in order to more closely follow the Lord. Anyway, the first idea that stands out to me is in verse 1: “Lord, you have been our dwelling place….” The thought of God as my dwelling place is nice, but what does it actually mean? Lately I have received help from the Spirit in trusting God more actively. This looks like praying a whole lot more, specifically in the midst of going over and over a worry in my mind. As a behavior analyst I know that when trying to eliminate an unwanted behavior it doesn’t work to simply stop it, because behavior doesn’t disappear into a vacuum– we are always doing something. No, it is much more beneficial to replace the unwanted behavior with a more desirable, appropriate, or beneficial one. Lately I have been working on replacing worry with prayer. When I read Psalm 90:1 my mind goes back to the feeling I get when I interrupt a worrying thought and begin to have prayerful thoughts. There is surrender, trust, and peace. That, to me, is the Lord being my dwelling place. I’m sure there is more to that idea of dwelling, but that’s what it means to me right now. The second idea that sticks out to me is at the end of verse 2: “…from everlasting to everlasting you are God.” The song emphasizes this phrase, which makes it comforting to listen to. I know I have heard this phrase many times over the years, but I never really thought about it as anything more than flowery, Psalm-y language. Now I’m seeing that it is so much more. It tells us about God’s nature and character. God is not God from beginning to end, but from always-has-been to always-will-be. He was not created, for he always was. He made us similar to him (made in his image), but he is not like us; he had no beginning and he will not pass away. 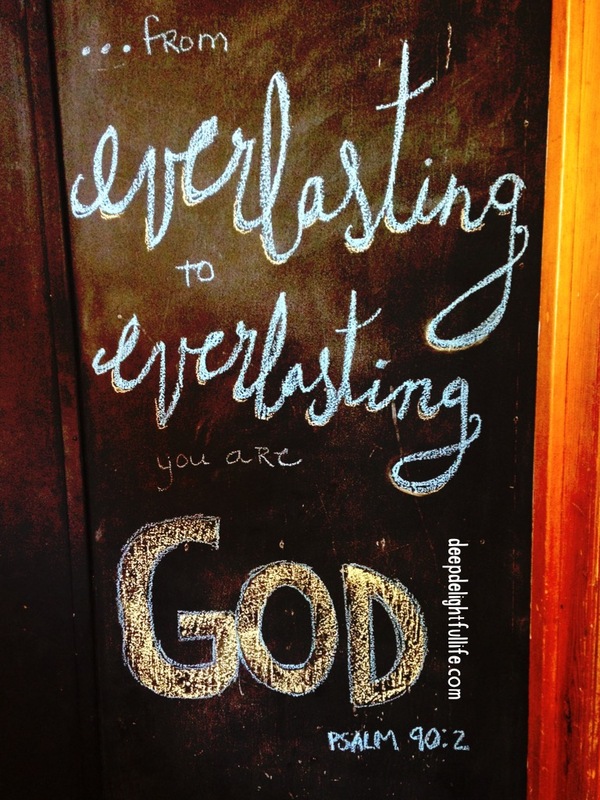 “From everlasting to everlasting” does sound poetic, but it is also informative. I’m glad I finally paid attention to this phrase. If I believe the Bible to be true and that God reveals his character to us through its words, if I believe the other aspects of his character that I’ve focused on in previous weeks– creator, holy, love, light, Spirit, truth, wise, faithful– then it is foolishness not to trust in him. Why would I spin my wheels in the mud of worry when I can bring my concerns to the God who existed before the world began? I mean, I still do spin my wheels that way sometimes; I’m pretty sure it’s human nature. But I hope in time I can replace that old, ineffective behavior with the more beneficial route of prayer. And when I say prayer I also mean trust and humility- acknowledging that I need God because I don’t know the future and worrying can’t change it anyway. I need these words this week and beyond. Dear everlasting God, please be my dwelling place. Verses 4-8 tell us some basics. Paul is about to address some division among the Corinthians, but he gives them some encouraging reminders first. These reminders can be helpful to us, too, as we focus on the faithfulness of God. Real quick, Paul is saying these things: God gives grace to his people through Christ, which in turn strengthens us in speech and knowledge and gives us spiritual gifts, and in all of this work God is doing in us he enables us to live a life of hope and expectation of Christ’s return. Oh, and he takes away our sins– I don’t want to forget that! Verse 9 tells us why God does this (or one reason): he is faithful. As I focus on this verse a couple of things stick out to me. The first one is how God shows his faithfulness, or how we know he is faithful. With Paul’s sentence structure being what it is, I find it helpful to read each of his sentences multiple times, rearranging the parts so they make sense to me. Otherwise I get a little lost, and sometimes I miss the most important ideas. I don’t think I’m alone in this! On my first reading of verse 9 I’m inclined to see “God is faithful” as the point, remember it, and skim everything else as just words as I move along to find the next point. But when I do my rereading and rearranging I find even more depth to the idea: God, who called us into the fellowship of Jesus Christ, is faithful. God is faithful to do the work in us that Paul describes in verses 4-8: giving us grace, enriching us in speech and knowledge and spiritual gifts so that we can give testimony to who Jesus Christ is, helping us to wait in hope for the day of Christ, and sustaining us until the end when we will appear guiltless before our Lord when he comes in judgment. Whew, that is a lot! But there’s more: God’s faithfulness is also displayed in his bringing us into the fellowship of Jesus Christ. This is huge. I often think of fellowship as being around other believers and having conversations together, maybe over coffee or food, talking about the Bible, giving encouragement, and/or praying. But I don’t think that’s the kind of fellowship Paul means here. Our fellowship with Christ is more than having some coffee and talking about our day; this kind of fellowship is a connection. This is the kind of fellowship that comes from being made children of God, and therefore co-heirs with Christ (Romans 8:17). This is a huge, gracious gift from our God, who we know is faithful if we will look back over his history. From the Garden of Eden to the Ark, from the burning bush to the Exodus, from the entrance into the Promised Land to the judges and kings and prophets, from the life and sacrifice and resurrection of Christ, to the disciples and the spread of the Gospel, to us right now… God is faithful. We can look back and know that God will be faithful to the end. It is his nature and character. The second thing that sticks out to me is more of where this verse causes my mind to go, which is a little outside the direct context of the verse. If God is faithful, he must be trustworthy. If he has given fellowship with Christ and is sustaining me until the end, then it must be worth my while to let him do his work. I can look back at God’s history in the Bible and see his faithfulness, but I can also look back at my own life to see it. Since God’s character is consistent, then he can be trusted. So the lesson that sticks out to me from this verse today is that I can look at the uncertainty in my life now and remember that someday I will look back at this time in my life and be able to point to what God was doing. And if that is the case, I should not worry about what may or may not happen. I will know eventually, but I can’t know right now. I only know what I know- no more. So with the information I have, not striving for what cannot be found, will I choose to strive for what I already know is mine– fellowship with Christ Jesus my Lord? I want to. My own thoughts, plans, and worries get in the way, but when I put God’s Word into my mind and heart it helps me remember what is true and what matters most. It’s my prayer that this Word in my heart will bring me into deeper fellowship with the One who changes me and sustains me to the end, who enriches my life to give testimony to his grace and, of course, his faithfulness. What are your thoughts on this passage and God’s faithfulness? Bonus: I also thought of this beautiful song by Matt Redman, especially the part that says, “You are faithful/God, you are faithful.” It is already competing with “God is Faithful” for space in my brain. 😉 They’re both welcome, of course. Listen to “Never Once” here. Annnnnnd, I found a really nice graphic to go along with my verse. Enjoy! I’ve been enjoying Labor Day weekend, so I hope I can keep this post short in order to enjoy a little more rest before preschool and youth ministry kick off this week. I also hope I can keep it short because I chopped my hand up while slicing some carrots Sunday night. Boo! I mandolin-sliced chunks off of the edge of my hand and the tip of one of my fingers. This is all on my right hand, so writing, typing, self-care, and pretty much all routine tasks are challenging at the moment. And probably for the next several days. Anyway, after Sunday’s church service I am ready for this passage! I was given the privilege of leading worship, and because the message was focused on the Spirit (Galatians 5) I chose songs that I prayed would tune our minds and hearts in that direction. And, as always, God came through. I got to see and hear evidence of his faithful presence in the praises of his people. By the grace of God we were worshiping together in spirit and truth: celebrating who God is, his love for us, the sacrifice of Jesus, the presence of the Spirit with the redeemed, and recognizing corporately our humble position before God’s righteousness. I love hearing the sound of hundreds of voices praising the Lord, and our congregation was really going for it! I am so encouraged by that sound and feeling. So with that image, sound, and feeling in mind I will be meditating on John 4:23-24. These words of Jesus were spoken to the woman at the well in Samaria, and the entire story can be found in the first 45 verses of John chapter 4. It’s an amazing story! In the verses of interest, Jesus is telling the Samaritan woman that soon “true worship” of God will not be about going to the correct temple but about the heart of each worshipper. Jesus’ sacrifice as part of God’s great plan to reconcile creation to himself would– and did– change everything. It is the same now. Worshipping God is not about going to the right church, singing the right songs, or doing a specific set of religious actions. Church services and music and religiosity are actually only a very small part of our worship. We are to serve God with our entire lives, following his Spirit and allowing him to cultivate his fruit in our hearts. My prayer for myself this week is that God will use the powerful memory of the voices of my church family and the feeling of unity in worship to remind me to seek him in everything I do. 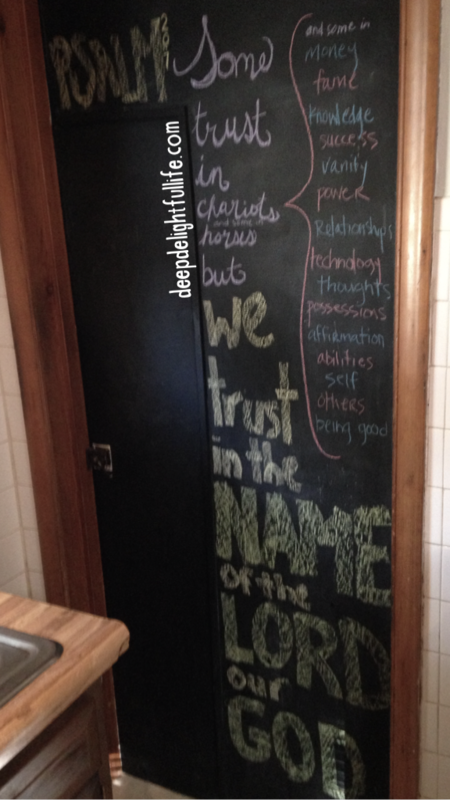 And to remember what matters most to him: the heart of the worshipper… my heart. All I need to do is surrender it to him and he will work, as he always does. There are a few things sticking out to me with this verse. First of all, it’s only one verse! But it is still just as full of ideas to ponder throughout the week. When I read the verse in preparation for this post, the part about believing the love God has for us really jumped out at me. You can know something, but sometimes to believe it is something entirely different. And knowing doesn’t just happen, but it is a process- we come to know. 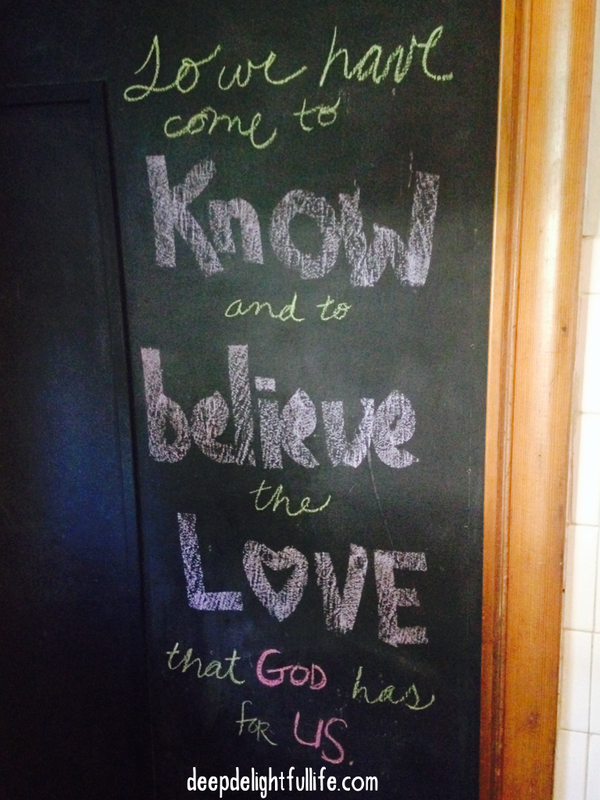 I have known that God is love for a looong time, but do I believe the love he has for me? Do I live in light of it? The way those words jumped out at me this time, I’m thinking maybe I don’t live as if God (who is love) actually has love for me. I do this earning/achievement thing, place guilt on myself that doesn’t belong there, and believe lies about my worth. I don’t think those actions line up with abiding in love. It would be worthwhile to study what the Bible says about the love of God, but just off the top of my head I can tell you it is vast, it is unending, it is powerful. That’s just from my head, though; I want to allow God’s love to overtake my heart. Time constraints are keeping me from writing more today, but I have plenty to think about as I go about my week, preparing for a new school year of ABA therapy, preschool, and youth ministry. My prayer is that I will identify areas of my own life where I need to believe and abide in love, but also that I can speak that message to others.